Arches National Park is a magical place, full of contradiction. At first glance, the desert appears devoid of life, yet stay still and pay attention long enough, visitors find it teeming with activity. Red rocks contrast sharply with never-ending cobalt blue skies set against snow-capped mountains that look like a fake Hollywood backdrop. Wild flowers in every color dot the landscape, hidden among the green of gnarled piñon pine, juniper, and fragrant sage. The warm days yield to crisp nights as soon as the sun dips below craggy spires and expansive mesas. Humans have been visiting this territory of southeastern Utah for 10,000 years, as evidenced by the pictographs, petroglyphs, and stone tools long left behind. As "recently" as 2,000 years ago, hunters and trappers moved into the area looking for foxes, mountain lions, mule deer, coyotes, porcupines, hares, and big horned sheep. 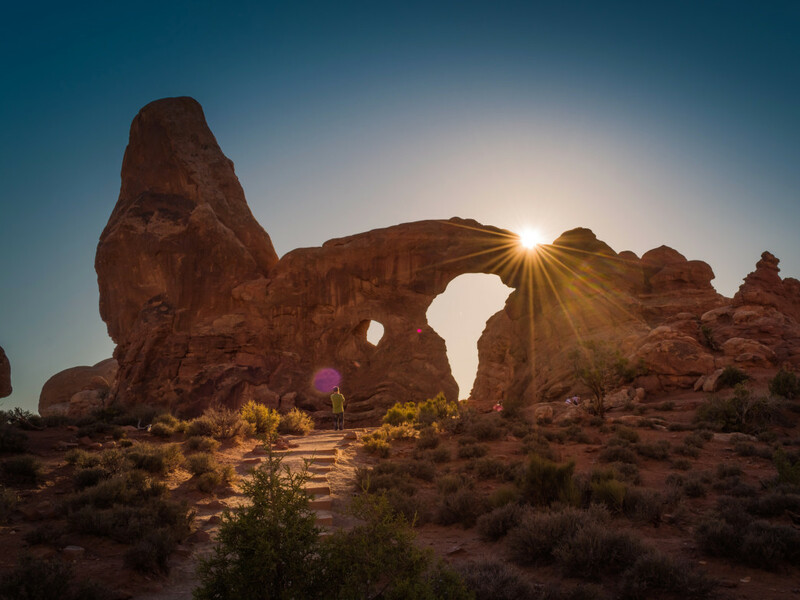 President Herbert Hoover established Arches as a 4,520-acre National Monument in 1929, it became an National Park in 1971 and now preserves over 76,000 acres. The park has had its brushes with fame. Prolific author Edward Abbey spent two seasons as a park ranger here and wrote about the experience in "Desert Solitaire." Hollywood has taken notice of its natural beauty as well. In perhaps the most famous, the opening shot of Indiana Jones and the Last Crusade features the Three Gossips and Balanced Rock formations, as well as Double Arch. 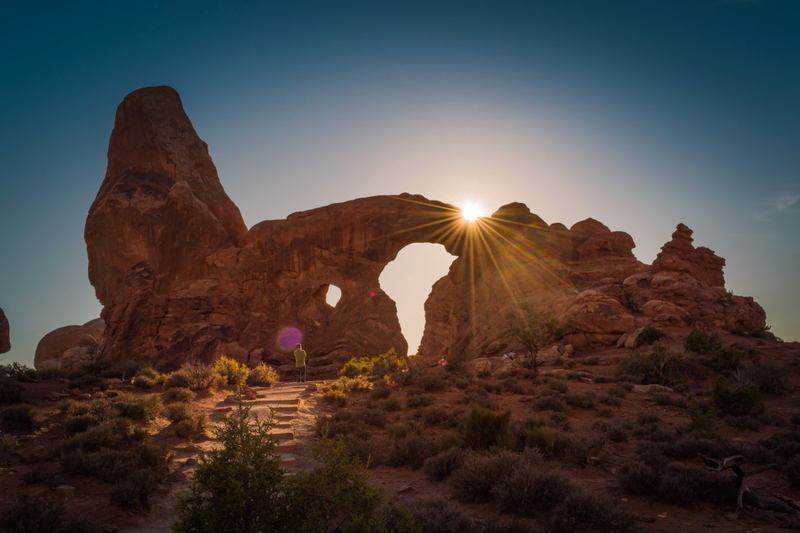 Arches has something to offer everyone, from family-friendly jaunts, to challenging backcountry treks. Whether you have just a few quick hours, or several days, visitors can gain a lifetime of memories, and an SD card full of pictures. A paved, 18-mile long road winds its way through the park, with 360-degree panoramas of humbling scenery that stretches as far as the eye can see. Pull-offs offer gasp-worthy photo opportunities right outside the window, and short walks along paved paths get up close to giant cliffs, eroded fins, impossibly balanced rocks, and of course, arches. There are over 2,000 of them in the park, the largest concentration in the world. 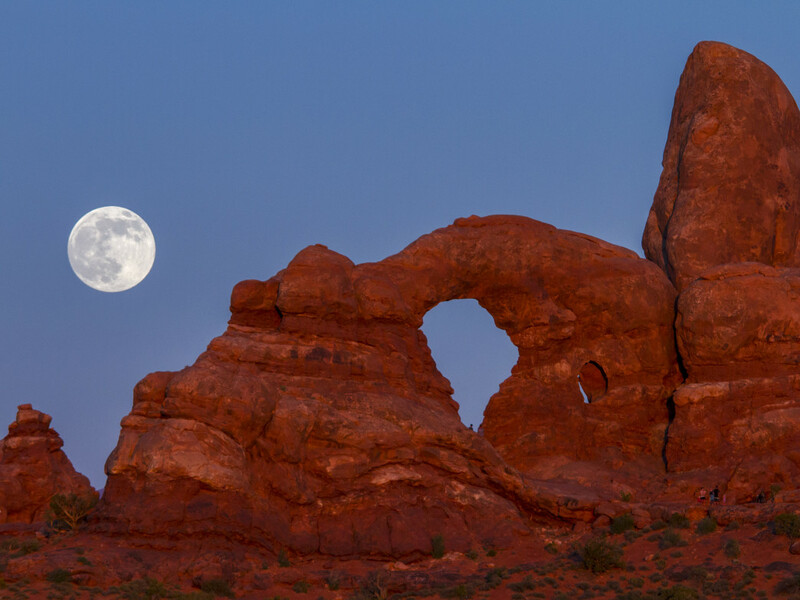 Most people beeline to Delicate Arch, the Park’s crown jewel, and Utah's state symbol. This is the park's most popular hike, and for good reason. The moderately difficult, three-mile round trip takes hikers over a 480' slickrock climb with views of the snaking Colorado river, and ends with a short section of mildly exposed rock ledge that yields one of the greatest reveals in nature. Arrive before sunset and get treated to a photographer's dream: the snow-capped, 12,000' La Sal mountains framed inside the arch, bathed in the gorgeous pink-orange hue of the day's last light. Though, be warned, the scene is shared with plenty of would-be Ansel Adamses. The best bang for the buck in a short amount of time is at the Windows area. Double Arch (the one from Indiana Jones), is a 10-minute walk along mostly flat, sandy trail. From there, another easy hike leads to Turret arch, and the North and South Windows. The Windows light up spectacularly with crimson red at sunset. It's arguably a better photo op than the more-famous Delicate arch, and far less crowded. The Devil's Garden is another trailhead with a high density of arches, it's also the site of the only campground in the park. The hikes here are longer and more difficult, so the crowds thin out as you get farther from the parking lot. 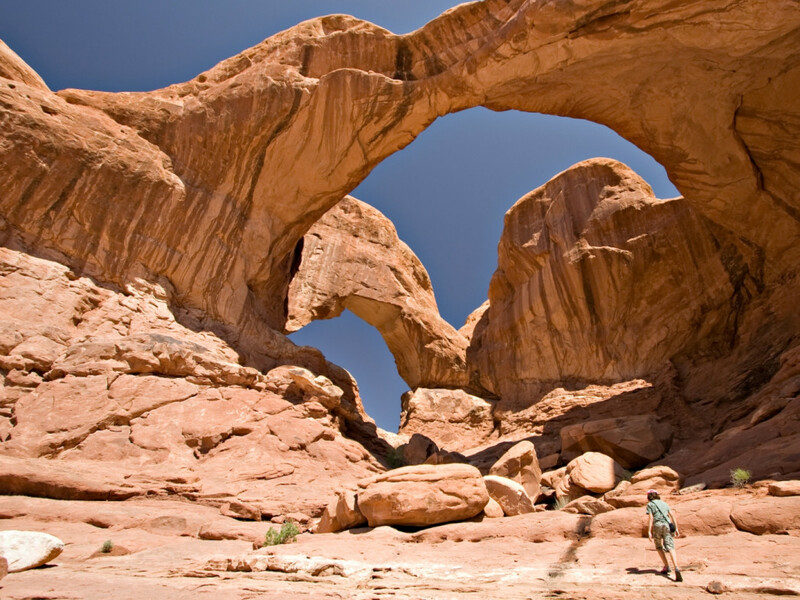 Landscape Arch, the world's longest, is an easy 1.6-mile hike on a gravel path. Those avoiding crowds hit the Devils Garden Primitive Loop. At 8.2 miles round trip, it's the longest and most rugged of the park's maintained trails, and many would argue the most fun. It features 1,204' of elevation gain and treks across narrow, exposed fins, rocky, uneven terrain, deep sand, and wide-open seas of slickrock. Those adventurous enough to tackle the 3-5-hour hike are rewarded with eight arches and the lonely, towering monolith called Dark Angel. Since rock climbing is forbidden on named arches and features, many people don't know that there are free-standing pinnacles, perfect cracks, and multi-pitch walls waiting. There are over 80 routes, most in the 5.9-5.11 range. Use of white chalk is prohibited. Road cyclists tackle the 46-mile ride (out-and-back, including two out-and-back side roads) with some big climbs and descents. Caution needs to be advised, there is no shoulder and riders share the road with Winnebagos that may be paying more attention to the awe-inspiring views than the road. There's also a paved bike path that connects the park to the town of Moab, five miles to the south. The round trip from Moab is about 55 miles with 5,000' of elevation gain. There are hidden petroglyphs near Dark Angel. They are not on any map, there is no established trail to the panels, and the rangers won't say where they are. If, while hiking a bit west of the spire, you happen across a sign saying, "You've found something unique, please preserve it," you’re in the zone. 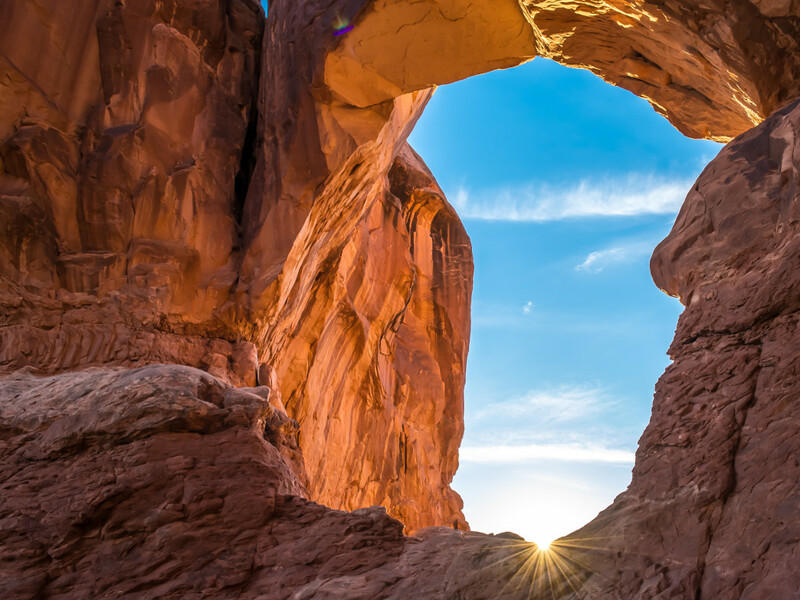 For those wanting some adventure, a trip through the Fiery Furnace, is one of the most interesting and spectacular places in an already breathtaking park. It's a picturesque labyrinth where trekkers squeeze through narrow passageways, hop across rock gaps, and balance across airy sandstone fins. Navigation is extremely difficult; there are no trails, signs, or cairns, and GPS is useless due to the tight, towering canyon walls. It's best to go with someone who's been before, or sign up for a ranger-guided hike. Permits cost $6 for adults, or $16 for the ranger-led hike. Both often sell out weeks in advance, so plan ahead. There are good pit toilets at all major trailheads, but the only water found in the park is at the visitor's center near the entrance. There are no lodging or supplies available in the park. As always, check the weather. Temperature swings of up to 40 degrees are not unheard of, be prepared with a few layers and a shell. The visitor's center always has the latest info. Photographers should bring a polarizing filter for deeper blue skies and more striking reds. With extreme heat possible and little shade, hats and sunglasses are a must. It's easy exert oneself without sweating, leading to serious dehydration, so drink plenty of water. Getting an early start is a good idea, in terms of both heat and crowd avoidance. The parking lots get full on weekends during the busy season, from March through October, especially during holiday weekends. Park passes are $25 for passenger vehicles, $15 for motorcycles, $10 for bicycles, and good for seven consecutive days. Annual passes are $50. To encourage visitation when less crowded, the park periodically reduces fees during off-peak hours. Advance posting appear on the Arches website and at the Moab Information Center.